Announcing a significant price reduction starting 1 January 2011 for DOUBLE SHUFFLE, SCARAB 350, SCARAB 16, SCARAB 670, SCARAB 8.0 and AVALON 9.0.and later the Scarab 22. We have decided to reduce the cost of the above designs to $150AUD. The plans will be provided on a CD or DVD in PDF format together with the Construction Manual (where available), Photos (where available) and the Material List. The purchaser will then be able to print the drawings to A4 sheets and have them enlarged on a photocopier to A3 size or take the disk to a plan printing or photocopying shop and have them printed to A3 size. This is a simple operation and will not cost much. The reason for doing this is to streamline our operations, some time soon we plan to go cruising (east coast Australia) and having an A3 printer with the associated stationery on board will not work, however a stack of pre-recorded CD�s or DVD�s is no problem. We will still have the mobile broad band internet and lap top computers so that receiving Emails will be ok.
At the moment the SCARAB 18 and SCARAB 650 will not be offered in this format but will still be supplied on printed A3 paper plans. We will print up a few sets of these and mail them out as required. This may change sometime in the future. 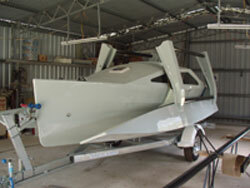 SCARAB 18, still not launched entirely due to the lousy weather we have been having. We have had a month of gale force winds, storms and heavy rain (350mm so far in December, a record). Last Tuesday was the best day we have had for sailing for a month but a fallen tree across the road out made escape impossible. The tree came down in a violent storm the day before. Hope you all have a great Christmas and Happy New Year and stay safe. 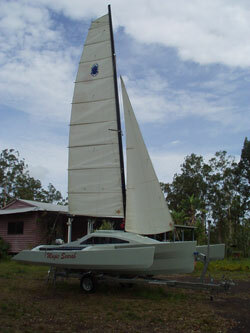 Hi, We have just raised the sails with the boat on the trailer in the yard. Needed to check out a few things including where the jib sheet track will go. I will try the mid boom main sheet location and see if it is ok, if not will add a wire hawse over he tiller as a traveller and move the main sheet aft. The sails are cut down Tornado sails and last week were complete with the Tornado logo and numbers. Old sail numbers are always difficult to remove and the Tornado ones were no exception. I used about 2 litres of acetone and much elbow grease to remove the old adhesive. I found the best way was to flood the adhesive with acetone and scrub/wipe with a rag and then scrape with an old credit card finally finishing off with more wiping with acetone and a spray of detergent/water. 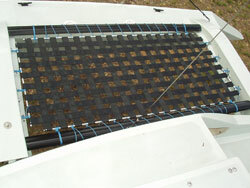 The trampolines have turned out great, made from 50mm wide seat belt webbing with a 50mm gap between. They are very strong and do not stretch. The only problem I can foresee is that spanners, screwdrivers, shackle pins, mobile phones etc will bounce and fall through. When we came to raise the mast we tried the old standard way of pulling on the extended jib halyard out in front of the boat, this didn�t work as the mast extended quite a bit out the back of the boat and I could not lift the end high enough. I fixed this problem by constructing sheer legs (in an A frame formation) which attach to U bolts on the forward beam (folded). The jib halyard is attached to the top of the sheer legs and an old main sheet tackle attached to the top of the A frame and the trailer winch post. Fran can now raise the mast with a bit of encouragement and steadying from me. I think it will be possible to raise the mast single handed once we get the hang of it. I will include details of the sheer legs with the plans for builders. As you can see in the photo we are nearly there. Trampolines and rigging are the only outstanding items. We have to stand the mast temporarily to check the actual length of the rigging, a bit of a pain but could save a few dollars to get it right. For the trampolines we are going to try making them ourselves. We have purchased a 100 metre roll of seat belt webbing (50 mm wide). The tramps will span between the two black tubes between the beams and remain tensioned when trailering, this will simplify and speed up the rigging process. The webbing will be sewn together with a 50 mm gap, we will try the sewing machine but if it can�t handle the webbing will stich it by hand. I have mounted a compass on the main bulkhead, purchased anchors, chain and line , purchased a hand held VHF radio and am booked in to get a VHF operator�s licence. The porta potti is installed and the cooking and eating stuff is washed up and ready. The boat name (Magic Scarab) has been cut and will be applied to the float sides and the aft side of the aft beam in the next few days. The Scarab 18 now has a name "MAGIC SCARAB". Magic is sitting up on the trailer and almost ready to go, just the thousand and one annoying jobs to complete. I decided on buying a ready made trailer after pricing one built to my specs. To have one built and galvanised was going to take about 6-8 weeks, the galvanising is the �hold up� but managed to find ready made (Australian) trailers not too far from home at a reasonable price. Some items required modification ie rollers, but that was easily fixed. Because the Scarab 18 has a flat panel at the bottom I installed wide flat rollers to accommodate this, also had to move the axle assembly forward a bit to correct the balance. The assembly progressed well with everything going together as it should. Because we are building a few of these boats we invested in an engine crane to lift the float/beam assembly which made the job very easy. This is not necessary for a one off builder although he might require some help lifting the assembly onto stands, boxes or sawhorses. I have found a wonderful implement for cutting aluminium, it is a circular saw blade which fits into the Makita saw and with a little cutting oil for lubrication will slice through a 25mm aluminium bar as if it were a wooden broom stick. The last time I made the pins (for the first Scarab 18) I used a hacksaw and it took quite some time. This blade is also very useful for cutting mast extrusions. A lot of holes need to be drilled when attaching fittings. Any fitting (on a foam sandwich boat) that will be loaded needs to have the foam removed for about twice the bolt diameter and replaced with a non compressible thickened resin mix. A bent nail or similar implement in a drill is the normal way to remove the foam but getting the thickened resin in has been a problem. In the past I have used hypodermic syringes and thrown many away after they have become unusable with hardened resin. Now I expel as much left over resin as can be expelled by pressing the plunger right to the end and let it stand overnight. When the plunger is completely removed next day a little resin plug is attached to the plunger which can be removed and the whole thing is ready for use again. Not sure if this works with epoxy but works well with polyester. I have a stack of tornado gear that I am adapting, things like the main sheet system, jib sheet blocks etc, this is a big saving buying everything brand new. The standing rigging will probably be spectra or similar, that will require some splicing, haven�t done any splicing of braided rope so that will be a skill to acquire. The next major expense will be buying an outboard motor, I am looking out for a 3 or 4hp Yamaha or Mariner/Mercury, if I can�t find a good second hand one will have to but a new one. 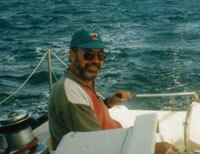 The next blog entry will be all about sailing MAGIC SCARAB with links to videos and lots of photos. 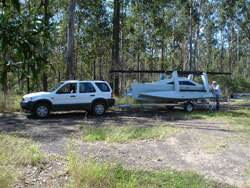 The launch will be at Tin Can Bay with a bit of an overnight cruise up the Great Sandy Strait. A few things to report. 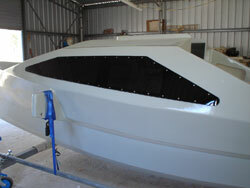 The Scarab 18 is still not quite finished but getting closer, other projects keep getting in the way. We now have a yahoo forum for Team Scarab Multihulls. Feel free to use it if you have any questions or news. I know these things take a few years to really get going but we have now made a start. I now have sails for the 18, I had an almost unused, excellent condition pin head Tornado mainsail cut down slightly. It is now a squarish top with reef points added, may get a new jib made but will see how the Tornado jib goes first. The mast will also be off a Tornado modified to fit the new shape of the mainsail. I have been doing a lot of driving lately and have discovered Audio Books. I download a book to my MP3 player and send it to the car radio via a MP3 transmitter. I am �re-reading� (listening) to all my old favorites and a few new ones as well. So far I have listened to �The Riddle of the Sands� by Erskine Childers, �Sailing Alone Around the World� by Joshua Slocum, �Trekka Around the world� by John Guzzwell, �Black Wave� by John and Jean Silverwood and several other titles. Some downloads are free, some have to be paid for but being able to listen to a book certainly makes the car trip more enjoyable.